Carp Road Animal Hospital in Stittsville, Ontario is a full service companion animal hospital. It is our commitment to provide quality veterinary care throughout the life of your pet. Our services and facilities are designed to assist in routine preventive care for young, healthy pets; early detection and treatment of disease as your pet ages; and complete medical and surgical care as necessary during his or her lifetime. We also offer complementary therapies such as Laser Therapy and Chiropractic for all types of pets. 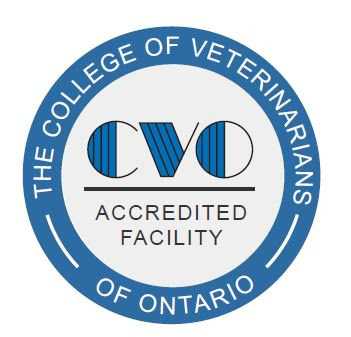 Currently Carp Road Animal Hospital is the only veterinary practice in Eastern Ontario to offer Radioactive Iodine Treatment for Hyperthyroid cats. We are pleased to offer Dr Mathieu Grenier services as a Certified PennHIP veterinarian. Thank you for taking the time to read about our veterinary practice and the services we offer. We welcome your comments and suggestions. Please contact us at (613)831-2965 for all your pet health care needs. Prevention is the best medicine. We've heard that before, but with all the products and services out there, things can get confusing. What vaccines are right for your dog? Does the Distemper vaccine really prevent my dog from getting mean? (Distemper has nothing to do with aggression). What products do we recommend for fleas, ticks, and heartworm? Prevention is the best medicine. We've heard that before, but with all the products and services out there, things can get confusing. What vaccines are right for your cat? Are vaccines "really necessary for indoor cats"? What products do we recommend for fleas and ticks? The stages of dental disease, before and after a dental. Don't wait until your pet has stage 3 or 4 dental disease. Schedule an exam today! 15% OFF DENTAL SERVICES FOR MONTH OF FEBRUARY! Iodine 131 (I-131) a radioactive substance that requires only one administration which is absorbed into the thyroid gland and will destroy only the thyroid tumor in 96%-97% of cats. To obtain treatment for your cat please contact your regular veterinarian.